« Microsoft Hololens Preview, Augmented Reality in 2015? So I decided to pick up GTA V for PC and I have dove into the online portions of the game. I must say that I am quite impressed with how it all works, I had played GTA V on consoles before but I have only played the online version on PC. It’s pretty fun being able to play custom scenarios with random people online! When I first logged on I had to make my character. There is a pretty cool spin that Rockstar took when it comes to actually creating your character. You have to pick who your mom and dad were and then that’s how your character looks, taking the genes of both parents and being the creation of it. You still get to edit your character how you see fit though, and there are a ton of options to do so not only including how your character looks in the face and what not but there are also many different types of clothing styles to pick from as well. 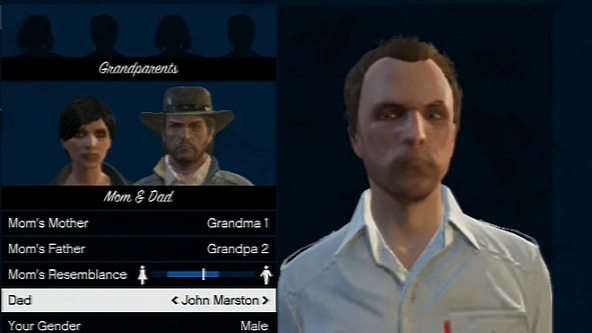 Once I created my character and gave my character a name I was then sent right into the tutorial for GTA Online. The tutorial starts you out with Lamar and he picks you up from the airport and gives you a pistol. Your character doesn’t say anything, doesn’t have a voice and Lamar makes a comment about how you’re very quiet. I’m sure Rockstar just didn’t feel like adding dialogue with the online characters but hopefully in a future GTA Online game we’ll actually be able to dictate our characters voice and maybe even the kind of tone/vibe he/she gives off as well. 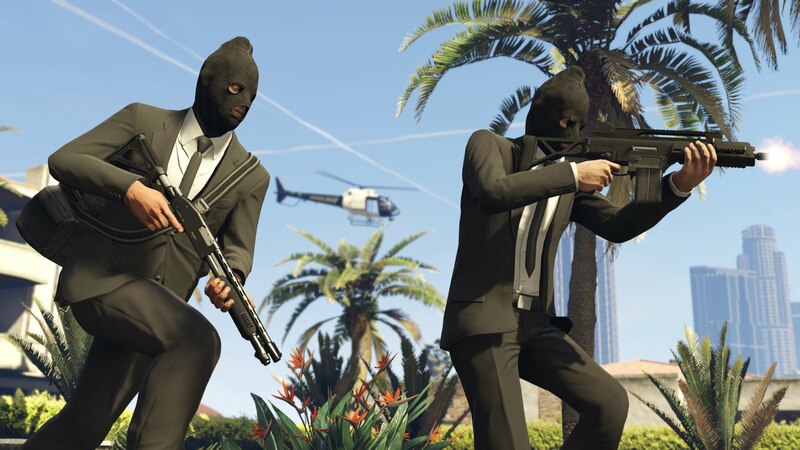 In GTA Online, players are able to go and do “jobs” for experience and money as rewards. Jobs can range from a bunch of different things such as races, bank heists, death-matches and many other game modes/scenarios. The first job that Lamar had me do was race a few real online players along side a computer controlled Lamar character. I beat Lamar, but an online player was ahead of me and I ate his dust. I ended up in 2nd, got some money for participating and I gained enough experience to get to level 2 for my character. After free roaming for a bit and getting my feet wet in this online world I started to actually go around and get into “jobs”, or games with other players. My first online match was 2v2 and we played two different maps. The first match we had to use pistols and try to gun down the enemy team. You can see enemies on your mini-map on the bottom left hand side so it was pretty easy for me to know where to go in order to defeat the other team. In GTA Online you can also just free roam around the map. It’s pretty much just like single player except you’ve got a bunch of other GTA players playing with you in the same area of Los Santos. You can go around and rob stores, setup bank heists and pull some grand theft auto by stealing random cars from citizens. If you do a bunch of illegal stuff then the cops will actually start chasing you down just like in single player mode. I think my favorite part about online, by far, is the ability to play custom scenarios/maps with other players. I got into one match where one team spawned on floating dumpsters with unlimited sniper rifles spawning right next to them. The other team spawned next to some extremely fast sports cars. There are a few ramps going up towards the dumpsters. The whole point of the map is that the team that is driving the cars has to try to get optimal speed and ramp up to knock the other players off of the floating dumpster before they land a good shot into your with their sniper rifles. 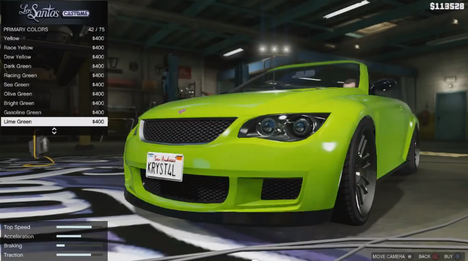 You can also get your own car and customize the crap out of it in GTA Online. Everything from the car rims, to neon, the colors of the car and much, much more. If you’ve played the single player mode of GTA V and customized your own car then you already know what type of customization there is for the online portion for the cars. It’s pretty much the same exact thing. When you’re able to customize your first car, Lamar tells you to just go find a ride to call as your own. This means any car that you find any citizen maybe driving or any car that’s just idle in a parking lot. When I first heard this I went out and tried to find the most luxurious car that I could find. I ended up at some golf course eventually and there were some high-end cars that were parked there. With enough money and experience, players are able to have garages full of the high end cars available within Los Santos. I gotta say, I was pretty disappointed at my result. Once I got into the high-end car, thinking I’ll be able to call it my own and customize it to my hearts desire, I got a pop-up message stating that I wouldn’t be able to bring this car into the garage for customization. I had to buy the car online if I wanted one for myself. Having only a few thousand dollars and the car being worth well over $100,000 I had to settle for a basic car. The car that I ended up picking up is very similar to Franklin’s first white car in the story mode of GTA V. I gave it a dark gray color with blue stripes and neon and then bought some insurance for it. When you purchase insurance for your vehicle you’re then able to get it back no matter what might happen to it. Anything can happen really. A player could take it, you could blow it up trying to ramp off of something and trying to be cool or maybe your car just gets a popped tire during a cop chase. However and whenever you lose your car and you happen to have insurance on it then getting it back is just one phone call and a $400 bill away from getting it back in no time. GTA Online is extremely fun. There are an unlimited amount of things to do and the above story of my experience with it is me only being about 4 or 5 levels deep into my character. I know that once players level up more they’re able to buy high-end apartments and super nice cars to customize. I’ll hopefully eventually get to a level where I’m able to afford whatever I want and to dominate each death-match due to the awesome weapons I’d be able to buy going to higher levels down the road! 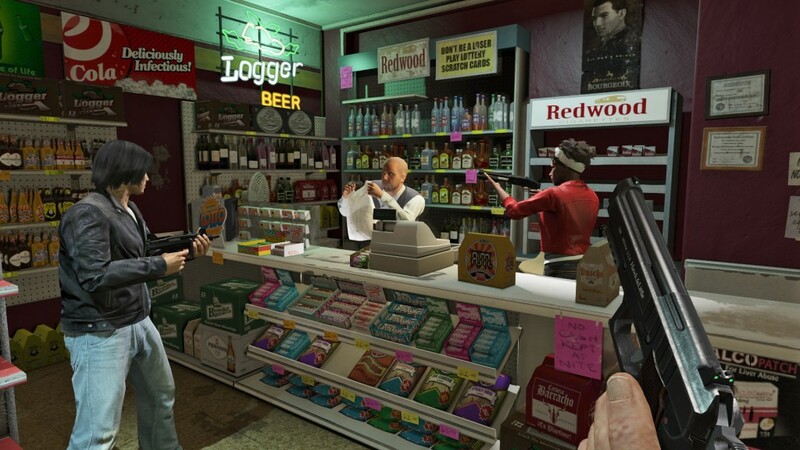 So what do you guys think of the online mode for GTA V? Do you have any funny stories to share with your experiences? 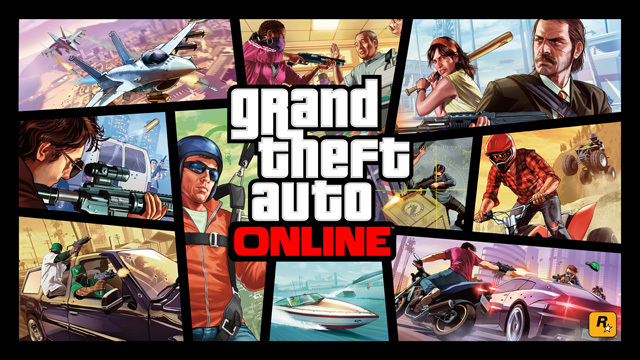 Tagged gta online review, gta v online, gta v online for pc. Bookmark the permalink. I haven’t played this as yet, my son keeps trying to encourage me into it but haven’t quite gotten around to it. Based one what I’ve seen and how he’s reacting to it, I think it’s time I really look into it finally, I like your review. GTA V is very fun, single player or online. I really like to free roam and just cruise around doing random missions, it’s a great time consumer that’s for sure lol! I didn’t know GTA had an online version. Great review, a person can really get a good idea of what to expect. Buying ‘insurance’ in a video game, who knew? Yes indeed. Who knows what kind of crazy realism will come about in future game titles especially with virtual reality right around the corner. Hi , I was playing gta v offline few days ago . I met with a problem , when i installed the game in d drive it ran on 30fps locked at normal settings with fxaa , msaa all off . But when I increased the graphics settings to very high with msaa , fxaa , txaa all on and even on 4x I was getting 50 fps . It was weird but due to some problem I installed it on c drive , now i am not able to get more than 30 fps even if I lower the settings or increase the settings . not a decent rig but still ok for me . That is weird man….I have, roughly, the same build as you. Was the 50 FPS due to being in an area of the game that doesn’t have a whole lot going on? ?